Sydney Sixers produced a superb performance to defeat table-topping Hobart Hurricanes last time out to consolidate their position in the top four of the BBL08 ladder but they know they have to keep winning with so many teams bunched around them. The Sixers won by nine wickets with 17 balls remaining thanks to a 167-run partnership between opener Josh Philippe and Englishman James Vince, who scored an unbeaten 86 and 74 respectively and their batting continues to be underrated but one of the most solid in the tournament. After two consecutive losses, the Sixers have been able to score back-to-back wins and a third-straight win here would leave them in a strong position to claim a play-off berth and they are boosted by the fact that they can name an unchanged squad for this match. Adelaide Strikers cannot afford to lose any more ground on the top four after a heavy 44-run loss in their previous game against Melbourne Stars and they must win this game in hand that they have on the teams above them. The Strikers currently occupy sixth spot in the table, four points behind the play-off spots but have a chance to close that gap on those above them like the Sixers which makes this match a win or bust game for them. With three defeats in a row, the Strikers come into this must-win game in poor form with big pressure on their bowling unit to perform after taking just two wickets in their last two matches and they are boosted by the availability of star pace bowler Peter Siddle who has been released by Cricket Australia to play. 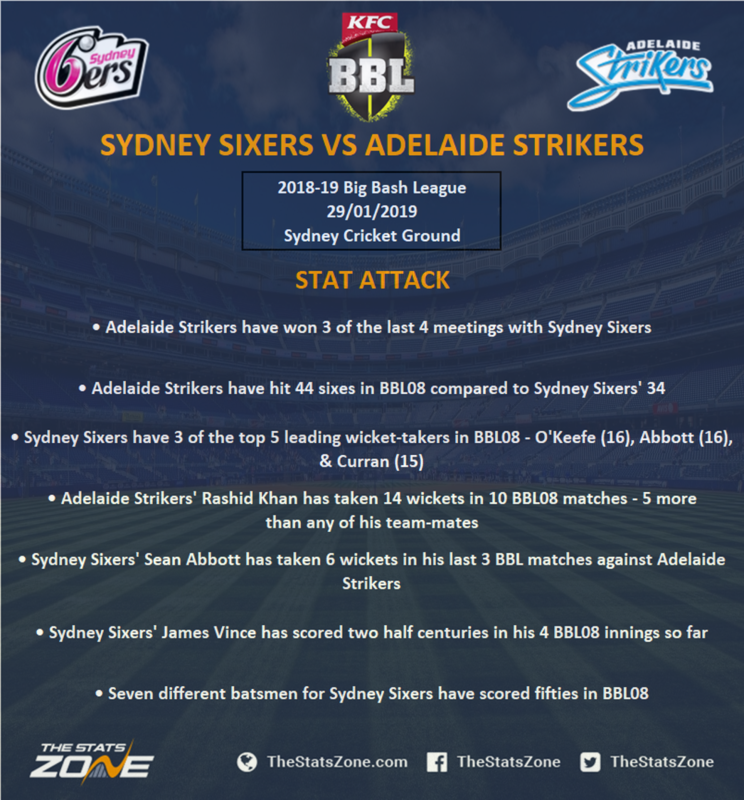 Sydney Sixers secured a huge win in their last game as they surprised Hobart Hurricanes to stay well in the mix for a play-off spot and they can further enhance those chances with another win against Adelaide Strikers. The Sixers built on a big win against Brisbane Heat with the victory over the Hurricanes and now host an out-of-sorts Strikers outfit. They have lost three successive games to leave themselves with plenty of work to do but Peter Siddle returns for this crunch match and he can spark a revival for them to upset the Sixers and remain in contention for a top four spot.